Brought Back for 2013 – Our popular “Wool Share” program. You will receive one skein of Silvia’s handpainted yarns every other month from January to July (4 skeins – January, March, May and July). Silvia will be creating a unique colourway for each of the months. 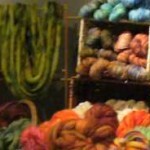 She’ll also be mixing up the yarn weights – you’ll get a different weight each time. The wool will be from a combination of our flock of Romney sheep (listed as “endangered” on Rare Breeds Canada) and a neighbour’s flock of Corriedales (listed as “critical” on Rare Breeds Canada). Some of the yarns may include angora mohair from a friend’s herd of angora goats (listed as “vulnerable” on Rare Breeds Canada). 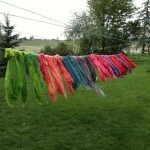 The dyes used for the handpainted yarns are “Greener Shades”, a line of dyes that don’t contain or use any heavy metals. Once you’ve turned Silvia’s yarn into your own masterpiece, show-off your pictures on our Facebook Fanpage – just search for “Stoddart Family Farm” on Facebook. Price: $99.95 (includes HST and shipping anywhere in Canada). The primary source of our wool is our flock of Romney sheep, a breed listed on the Rare Breeds Canada list as endangered. The particular genetics in our flock have been selected for spinning quality for over 20 years (they were owned by a hand-spinner prior to Silvia acquiring them in 2007) yielding a long staple, nicely crimped and fine fibre. 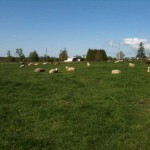 Our flock is managed organically and are given free run of our pastures from early spring to late fall. We sell fleeces “in the grease”, washed fleece, dyed fleece (perfect for needle felters), roving, dyed roving, and various weights of yarn. All our processing is done at Wellington Fibres near Elora. They are the most environmentally and fleece friendly mill we can find in Ontario. Their primary source of heat for their wash water is a solar collector and all the soaps they use are citrus based. This yields a soft, luxurious garment whether you’re hand spinning or knitting from our yarns. However, because they don’t put the wool in a sulphuric acid treatment, you will find the odd bit of VM. We do our best to keep the fleeces clean and the picker gets most of the VM out but there is always some that sneaks through. We think a little VM here and there is a small price to pay for not having the wool treated with sulphuric acid. Silvia does all the dyeing herself, mostly in small batch hand painted lots. Making the best environmental choice for dyeing is challenging. “Natural” dyestuffs often require a chemical mordant to fix the bright colour. Our choice is a line of weak acid dyes called Greener ShadesTM that contain no heavy metals and use no heavy metals in their manufacture. They can be set with vinegar and reliably completely exhaust in the dyeing process. Hi Sylvia….we met at the show today. I bought some dyed rovings …came home and started felting a pair of slippers …it won’t felt. …..what am I doing “wrong! Could you send us an email at farm@stoddart.ca with your phone number. Silvia needs a little more info to help solve your problem. The only thing that jumped to mind immediately is that Romney takes a little longer to felt than short staple fibres such as Merino. Just wanting to pass along the pattern author’s name for the felted slippers I showed you today- Monique Rae. I hope you had a great time! It was lovely to chat. I have some of your Womderful Romney fleece from the Woodstock fleece festival, and I can happily attest to its softness, loft and strength. It has been a joy to work with! Thank you. We’re always glad to hear that people are enjoying our wool. Unfortunately I just found out about your yarn CSA now that it’s almost over. Is it possible to sign up to get the last instalment? Or shall I wait until next year? 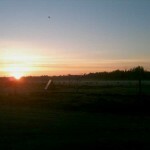 Also, for your meat and egg CSA, do you have a pick up location in Etobicoke? Still time to sign up. There is a drop on the west side of Etobicoke near the 427. Karen: Thank you for your long time patronage. At this time, we’re not looking to add any outside animals to our herd. Have a great day. Hi I would like to visit your farm. I’m mostly interested in your wool maikg. I am a knitter. When is a good time to do this? May 23rd we’re having an open house from 1-4. The open house was postponed to June 13th. do you sell your raw fleeces? i would love to purchase one and have it shipped to me if you guys do that. thanks. Yes we do. What sort of fleece are you interested in? Approximately how much wool do you get in the wool share program? 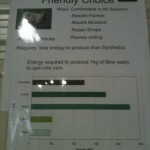 I understand that it varies but is there a minimum weight guarantee? We are no longer running the wool share program. 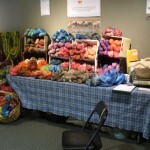 Actually, is it possible to visit the farm and buy yarn? Please let me know a good time to stop by and if you do have yarn available. We’re currently rebuilding the building which housed our store – a severe storm caused enough damage to require the building to be demolished and rebuilt. We don’t have a lot of stock of dyed yarns currently, mostly natural whites. You can call us at 705-786-7705 to talk to Silvia about what you are looking for.